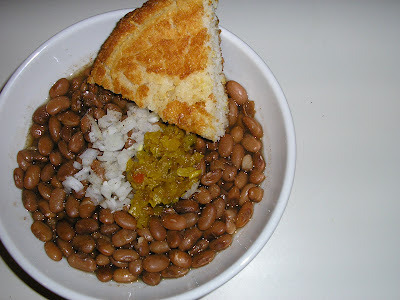 Pinto beans topped with chow chow relish and minced onion-- the only way to have 'em. 2012 has been an eventful year, to say the least. February alone handed me a rejected cookbook proposal and an out of print cookbook. This type of rejection isn't easy for any writer, but it definitely stings more when suddenly the entire planet seems to be tweeting, "So excited! I just signed my first cookbook deal!" While I'm happy for everyone's success, I'm also still trying to find my place amongst an ever-changing and finicky industry. The good news is, my first book, "White Trash Gatherings: From-Scratch Cooking for Down-Home Entertaining" which was originally published by Ten Speed Press back in 2006, is in my hands as I've had the rights reverted back to me, an option that many publishing companies offer writers once a book has officially gone out of print. I'm truly proud of this book, and I feel blessed to have had the opportunity to bring our family's recipes, tall tales and entertaining tips to dinner tables all over the world with making a few ducats in sales at the end of the day serving as icing on the cake (an almost unheard of concept in today's over-saturated, underpaid world of food writing). Additionally, I was lucky enough to have a great editor and a fantastic publicist to help me see the book through several years and a couple of reprints. 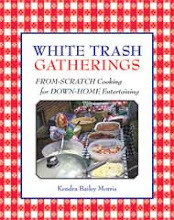 Yet, White Trash Gatherings was published over six years ago, long before the onslaught of blogging and social media. Back then, I co-marketed the book through thankless in-person book signings, radio, television and print coverage, and *aghast* a monthly email newsletter. I can only imagine how things would have played out differently in a world led by Twitter, Facebook, Pinterest, blogging and self-marketing. So, here I sit with this book of mine that could possibly be on the cusp of a sort of renaissance due to many factors including the success of a certain genius of a show, "Eastbound & Down" along with plenty of other prime time TV trailer-related shows. For more about the "White Trash Cooking" meets Kenny Powers connection, check out this LA Weekly piece by food writer Jen Garbee who juxtaposes Micker's original cookbook to Eastbound's colorful characters, highlighting the inherent comical beauty that lies in a combination of "insult and entertainment". Fact is, when White Trash Gatherings was originally released in 2006, it was not particularly well received by mainstream media. 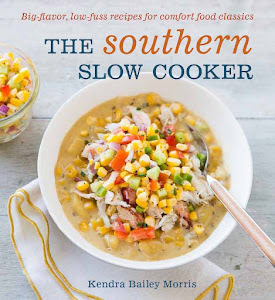 We had a terrible time getting anyone to blurb or endorse the book, especially food writers, authors and experts who specialized in Southern cooking, and for the life of me, I couldn't get a review in any major publication (keep in mind I had big publisher's marketing team behind me, too). In the beginning, I thought there was simply little interest in the book's concept (i.e. spiral bound, low-brow humor and recipes, and shoddy photography by yours truly). It was later that I found out no one wanted to touch the book because of its title. Not only did I hear this firsthand from several fellow journalists as in, "I really love the book, but my editor would fire me if I featured it", but I got a true taste of the vitriol two single words can incite when I did a 30-plus radio book tour where either the interviewer was lambasting me for writing something so horribly offensive or the callers were. Toss in some nasty emails, multiple venues and book stores that refused to host book signings because of the title, and even a few in-person altercations, and I'm shocked the damn book sold at all. Most of the people who took issue with the title never advanced past the cover page. I did countless interviews where it was clear the host hadn't so much as read page one. So much for the "don't judge a book by its cover" thing, I guess. Yet, today is a new day, and Lord knows the food writing world has changed considerably since 2006 with some arguing that the web has become so engorged with foodie everything that it has actually come full circle. Fact is, the world of food is ever-evolving and that will never change. If you want a career in food writing, you'll need to hop that raft and ride it on down the river with everyone else, and that often means finding nontraditional ways to feature your work, which is where I hope to take things. It's abundantly clear that Southern cooking is trending (by the way, I HATE HATE food trends, but that's another discussion). I think it was when I saw this that I realized that herb roasted capon has officially been replaced with chicken and dumplings, at least for 2012. While Southern cooking (or as my family calls it: country cooking) has graced many-a-table for generations, it is now clearly a hot commodity whether you're talking restaurants, media or current food movements that could potentially change the culinary landscape as we know it, so why not jump on that bandwagon while it's still rolling? In all honesty, I am still in the planning stages of what I'll be doing with the content of "White Trash Gatherings". Perhaps I'll be publishing some snippets on my blog or maybe I'll look into something more digital. White trash recipe app anyone? Whatever I end up doing, I'll know that it's all mine, and that's something I can be proud of. I'm excited to share bits of my book with anyone who appreciates good country cooking, a couple of laughs and who doesn't give two you-know-what's about semantics. Put beans and water in a cast-iron cooking pot on medium heat. Wash the salt off the piece of fatback and put it in a microwavable coffee cup and cover with water. Microwave on high for 30 seconds or so, then turn the fat over and do the same for another 30 seconds. Pour the fatback and broth into the cooking beans. Once the beans begin to lightly boil at medium heat, lower the temperature to low, cover and cook for about 2 hours. Every half hour or so, uncover beans and give them a stir, making sure they are simmering in enough cooking liquid. If beans appear dry, add a little more water. Once beans are tender, season with a little salt and plenty of freshly ground black pepper before serving. Sift white cornmeal, cornbread mix, sugar, salt and baking soda into a big mixing bowl. Add fat drippings to a cast-iron cornbread pan (or muffin or cornstick pan) and warm it on the stove. When drippings are melted, tilt pan so the sides and bottom are well greased. Then pour off and reserve two tablespoons of drippings. Mix grits and water in a bowl and microwave on high for 3 minutes. Stop and stir and then microwave again on high for 3 minutes and set aside. The grits will be about half done, but that's OK. Whisk egg in a bowl. Then mix egg with buttermilk and add to the dry ingredients. Stir until the batter is well mixed but still a bit on the firm and dry side. Add the reserved pan drippings and grits. Mix all of the ingredients well with a large spoon. (If grits and water have cooled, reheat for 30 seconds before adding.) Your batter shouldn't be too dry or too wet, but somewhere in between. Pour batter into pan and bake for 20 to 25 minutes. (Cornsticks take slightly less time.) Your grit bread is done when a nice, golden brown crust has formed. Now, all you need to do is get a big slab of butter and dig in! Cooking Tip: Leftover grit bread makes mouthwatering fried cornbread. Just heat up a griddle or cast-iron pan and drop in a small bit of butter. Then fry up your leftover cornbread wedges until they are nice and golden brown. ©2012 Fatback and Foie Gras. All rights reserved. This material may not be published, broadcast, rewritten or redistributed without permission. Congratulations on your book! That's so exciting! Kendra, you had me at fatback. With that in the world all is good. That grit bread looks amazing--I bet it has great texture!